Who doesn't like painting? I guess most of us enjoy painting our pictures to the best of our test. We always want our images to look sharp with many styles on it, just to see that we appear smart and beautiful once the pictures are uploaded to social medias like, Facebook, Twitter, 2go, BBM, Google+ community etc. So that friends will start to comment good about them, lols we all know our selves. As the day go by, new things keep coming while the old once are being kicked out, that is becoming outdated. So far, so good I came across another latest application which can paint, design the pictures with many styles that all would want to apply once this app is being installed in our device. This very prisma app is better and nice in terms of painting and the most funniest thing about it that I found out is that, for the little time people got to know about this app prisma, seriously speaking, the app has gotten millions of download. So its time for you to enjoy the app as well. This app can change your photo into resembling actual artworks by real-life painters. 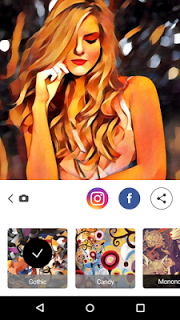 Prisma's algorithms, It will re-draw the image and bring out an awesome result, This app is really good for people who love painting, I will advice them to go for this. Prisma application is only available on Android and IOS devices, below are the links you can download Prisma from. Download Prisma for IOS Devices by clicking here.